Iraq regularly parades volunteers to "liberate Palestine"
Saddam Hussein has paid out thousands of dollars to families of Palestinians killed in fighting with Israel. Relatives of at least one suicide attacker as well as other militants and civilians gathered in a hall in Gaza City to receive cheques. "Iraq and Palestine are in one trench. 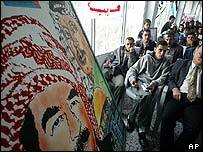 Saddam is a hero," read a banner over a picture of the Iraqi leader and Palestinian leader Yasser Arafat at the ceremony. With war looming in the Middle East, Palestinian speakers condemned the United States and Israel, which dismissed the ceremony as support for terrorism. One by one, at least 21 families came up to receive their cheques from the Palestinian Arab Liberation Front (PALF), a local pro-Iraq group. A Hamas suicide bomber's family got $25,000 while the others - relatives of militants killed in fighting or civilians killed during Israeli military operations - all received $10,000 each. Another banner in the hall described the cheques as the "blessings of Saddam Hussein" and PALF speakers extolled the Iraqi leader in fiery speeches. "Saddam Hussein considers those who die in martyrdom attacks as people who have won the highest degree of martyrdom," said one. The party estimated that Iraq had paid out $35m to Palestinian families since the current uprising began in September 2000. Saddam's avowed support for the Palestinians, and his missile attacks on Israel during the Gulf War, have won him wide backing in the territories. Israel condemned the Iraqi handouts as funding for terrorism. "It shows that Saddam is involved in every activity that is terrorism and murderous and leads to instability in the Middle East," said Amira Oron, a spokeswoman for the Foreign Ministry. However, families at this week's ceremony said the money would be used to rebuild homes destroyed by Israel and bring up orphaned children. "Saddam supports the families of the martyrs, not terrorism," said Ahmed Sabah, 69, whose son was killed by an Israeli missile strike in December. "It is a shame that Arabs stand silent as America prepares to occupy Iraq." 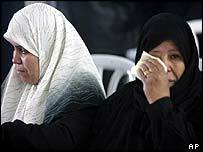 Israel blamed Mr Sabah's son Mustafa for bomb attacks on three Israeli tanks which killed seven soldiers in 2002. Tahseen Maghani, whose Hamas militant son Karam was killed trying to infiltrate the Jewish settlement of Netzarim, said he would use the money to plant crops and build a house. "These are tough times for Saddam but his kindness will help us a lot," he said. "Saddam is the only one that has stood with us." Sabri Salama, a relative of two Palestinian teenagers killed in an Israeli air strike on Gaza in January, said America was "the chief terrorist state". Ibrahim Zanen, a PALF spokesman, said he hoped the ceremony would not be the last.